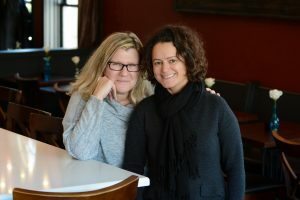 Tamela Greene and Anne Marie Arroyo have introduced a New York style restaurant and bar to the quiet downtown area of Whitefish Bay. Located on Silver Spring Drive, MOXIE Food + Drink offers a classy interior and a menu filled with comfort food and cocktails. With backgrounds in business development and food service, the partners make the perfect team for a restaurant start-up. Having worked for Harley Davidson for more than a decade each, Greene and Arroyo brainstormed about what they really wanted to do next after leaving the company in 2015. With two sons aged 10 and 13, it was important to Greene and Arroyo to stay local and contribute to their community with their next venture. Brainstorming the best way to share their talents with Whitefish Bay, the entrepreneurs decided that the village could use another sit-down restaurant for brunch, lunch, and dinner. Before moving forward, they surveyed over 200 community members to see if they agreed: The response was overwhelmingly positive. The couple first connected with the LGBT Chamber of Commerce through their previous positions at Harley Davidson. The Chamber connected them with the Wisconsin Women’s Business Initiative Corporation, an organization that provided funding for the development of MOXIE. Greene and Arroyo say that attending events organized by the Chamber has been a great way to build business connections and expand their network. In interviews for the Shepherd Express and the Milwaukee Journal Sentinel, Greene and Arroyo have consciously been open about their marriage. They want to set an example as leaders and role models for their sons by showing pride and staying true to themselves in the public eye. Greene says she’ll always remember an encounter she had with a customer not long after the opening of the restaurant. The patron told Greene that she couldn’t wait to tell her daughter about MOXIE. Sharing that her daughter lives with a partner in San Francisco and identifies with the LGBT community, she told Greene how proud she would be to bring them to MOXIE when they came to visit. MOXIE’s menu is a creative spread that includes whitefish piedmont, pork belly eggs benedict, and candied bacon. On Opentable.com, the restaurant has received stellar reviews–it’s hard to find a rating below 5 stars. Check out their Facebook Page.